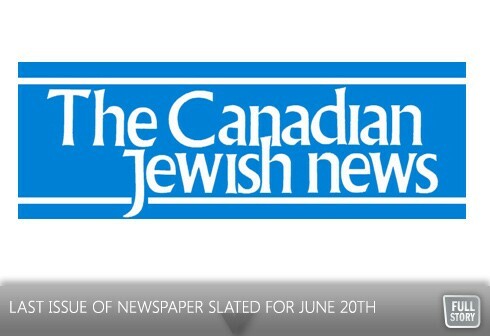 By Daniel Horowitz--After more than four decades as a vital component of Jewish Canada, the Canadian Jewish News announced yesterday that its last issue will roll off the presses on June 20th. “We are pained to have to make this decision,” wrote Donald Carr, the President of the Canadian Jewish News, in a statement. “We know the role that The CJN has played in the community for the past 42 years. Notwithstanding our editorial integrity and a cadre of superb writers, we face an evolving society, a different readership and changed demands. In response to the unfortunate news, Ted Sokolsky, President & CEO of UJA Federation of Greater Toronto, issued the following statement. UJA Federation is saddened that the Canadian Jewish News print edition will stop publishing after the June 20 issue. The Canadian Jewish News is more than a newspaper. For more than 40 years, it has served as a Canadian Jewish institution, familiar and comfortable, reflecting Jewish events, experiences and viewpoints from across Canada and around the world. The CJN is a mirror of Jewish life in Canada, often covering stories of minimal interest to mainstream media. Yet, media outlets everywhere carefully read the Canadian Jewish News to gain insight into Jewish perspectives on issues of the day. Through the CJN, non-Jewish Canadians acquired greater understanding of Canada's many Jewish communities. Although the loss of the CJN's print edition will particularly felt by Jewish Canadians, it a significant loss for Canadian journalism. We wish the CJN every success in its new online endeavours and we offer our assistance to the Canadian Jewish News in its efforts to maintain the newspaper's proud tradition online.